At various Zone 7 (Northern California) President’s meetings through 2015 and 2016, there was talk of doing a special Tour involving some or all of the ten Regions. 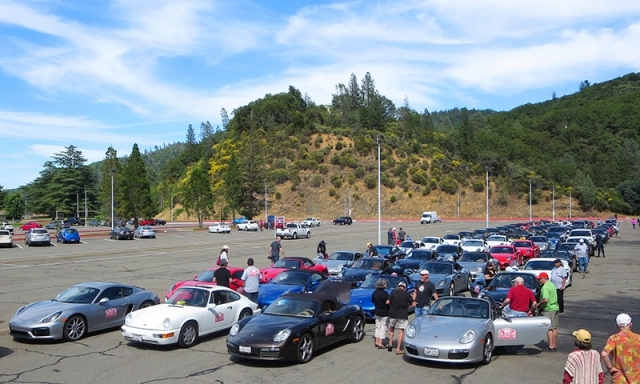 It would be a long Tour, highlighting the many scenic roads and byways of Northern California. Rather than a “Tandem Tour” where several individual Tours linked together over several days, this one would be a single group of participants driving the entire Tour together. In January 2017, after months of planning and discussion, the Presidents gave their “Go-Ahead” to a Tour covering the three northernmost Regions. They handed over the task to a small committee comprised of representative members from those three–Sacramento Valley, Redwood, and Shasta. The committee envisioned the concept of the Tour and assigned tasks to embark upon this most elaborate and detailed endeavor. They selected June 1-4, 2017 for the date, so as not to conflict with other Zone 7 events. The logistics were daunting. The first challenge was to decide how many could participate. Though all 7000 members of the Zone would be eligible, for logistical and safety reasons it was decided that participation had to be significantly restricted. They concluded that a maximum of 60 Porsches with 120 participants would be the maximum that could be accommodated. Of course, we couldn’t drive 60 cars in a single line, for many obvious reasons. Safety dictated that we would break into four Teams of 15 cars each. With two-way radios in hand (required for all participants), a Lead, Sweep, and two “Relays” would be assigned to each Team. The Teams would drive “in tandem” but with a space of 15 – 20 minutes between each. The first major task was to define the route. The overriding theme was to avoid traffic and use two-lane roads as much as possible. The Tour was to cover 885 miles, and over 90% met that objective. We were planning to be “in the seat” for 18-20 hours. Some of us on the Committee have had extensive Touring experience, but none of us could find any model to follow for a multi-Region, multi-Day Tour of this sort. We didn’t know if this would be met with a flood of interest, or barely a trickle. After scratching out a budget, we announced the Tour to the entire Zone by means of an email “blast”. To our very pleasant surprise, all sixty positions “sold out” in a matter of hours, and we were forced to create a Waiting List! We knew we were on the right track. We wanted to explore the scenic rivers, canyons, mountains and beaches of Northern California. The “downside” of this noble goal is that there aren’t many population centers that can accommodate large groups– for lunches, dinners, sleeping accommodations, and yes, bathroom stops and rest areas. And there are no Porsche Dealers in the mountains! So “designing” the Tour was like writing the script to a movie. When “on location,” you still must have all of the resources available for “the crew”, even in remote areas–at least as well as you can. And when you cannot, you have to provide alternatives. 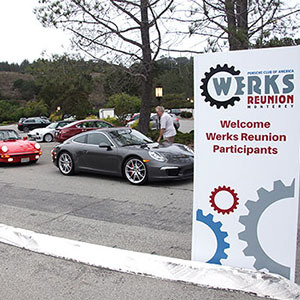 The reason for the 15-20 minute breaks between the Teams was that there were no rest areas large enough to accommodate 30 cars (not to mention anyone else who happened to be there already!) We tried to have no more than one Team in a rest area at a time. So, we would park where we could, and when the following Team would come along, they could just “take our place.” It actually worked quite well. Lunches worked out well that way also. No venue can feed 120 people at a time, especially if the arrival time is delayed (due to road construction, etc.). And since we were on a tight time schedule, we needed to limit our lunch time to an hour or so. Even small restaurants can typically prepare for 30 people at a time, but not 120. Arriving at their venue in “waves” of 30, actually made them more efficient and worked to our mutual advantage. Dinners were less of a problem, since we stayed in larger population centers and we ate together. That was our time to get to know the members of the other Teams in a fun and relaxing atmosphere. It was advertised as the “Zone 7 Tri-Region Tour” since, as I mentioned, it featured, and was sponsored by Shasta, Redwood and Sacramento Valley Regions. In fact, we started in Redwood, traversed all of Shasta, and ended in the Sacramento Region. Day 1 was a typical late Spring Day in the Sonoma Wine Country–cool with a little coastal fog. We started out by taking narrow country roads out of Santa Rosa to coastal Hwy 1. We stopped a few times along the ocean in small bergs for breaks and to enjoy the scenery. Highway 1 takes us North and we stayed on it, never far from the coastline for 172 miles, where this scenic road actually ends. 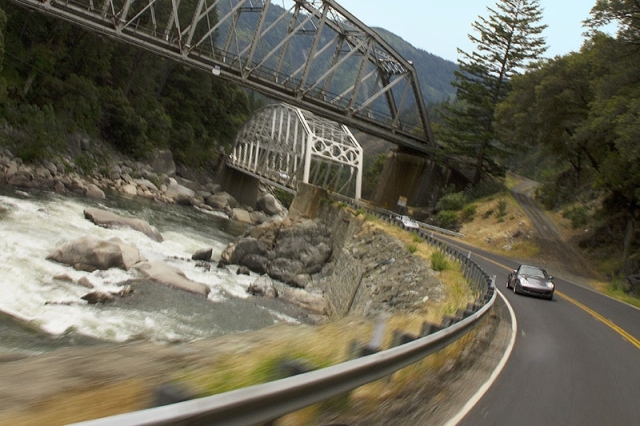 Hugging the Pacific Ocean, passing through fishing villages and coastal forests on winding, challenging roads for hours, is what driving a Porsche is all about! This section has some of the tightest turns one can ever imagine, and ends with a 22-mile roller-coaster “one-of-a-kind” section. From there, we turned North on Hwy 101. We detoured through the Avenue of the Giants (the longest drive through a Redwood Forest on earth). After an overnight stay in the coastal town of Fortuna, California, Day 2 began with a leisurely drive further North on 101 for a short distance through Eureka, where we hit Zero Feet elevation (Sea Level). Within minutes, we turned East on SR299 for a very rapid climb of 2400 feet to an Overlook –a panoramic view of the entire coast and ocean. We then continued into and through the Humboldt and Trinity Alps region of California. The rest of the day took us through this area–next to, and over lakes, rivers, rapids, bridges and dams. The Crown Jewel was our experience at Shasta Dam. This is the second largest Dam in the United States and the third largest in the world. It holds back Shasta Lake, which is California’s largest reservoir (4.5 million acre-feet with 365 miles of shoreline). In the backdrop is the 14,000-foot Mount Shasta, part of the Cascade Volcano Range. We had a surprise for the participants. We were very fortunate in that we applied for, and were granted, a permit from the Dept. of the Interior/Bureau of Reclamation to have exclusive use of the Dam and Roadway (normally closed to traffic) for two hours. This is a Homeland Security Site. 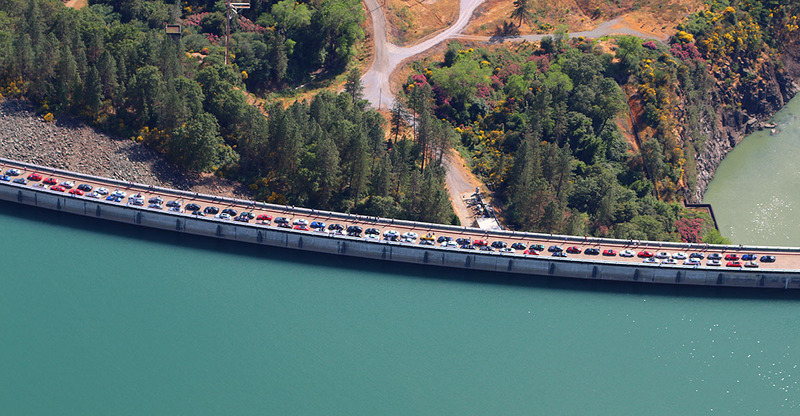 The only way to see the cars AND the dam in one view would be from the air. Fortunately, the California Highway Patrol heard about us and graciously flew their helicopter over us and took photos. Thank you, U.S. Bureau of Reclamation and CHP. At the end, they lowered the barriers and we all exited the structure together. A short ten minute drive took us to the night’s destination in Redding to check in to our hotels and get ready for dinner. That night, there was an “elective.” Just two miles from our hotels in Redding, there is a world-famous bridge over the Sacramento River–the Sundial Bridge, designed and built by Calitrava Santiago (who subsequently designed and built the stadium for the Athens Olympics Sports Complex). None of the bridge touches the water; the deck is glass; the sundial rests on three small pedestals and rises 217 feet into the air. From there, the cables stretch across the river and support the entire 700 foot long structure. It is breathtaking to walk across. You can also walk underneath the structure, and look up through the glass deck! The last part of the day followed Historic Highway 49, the original Gold Discovery Highway. The Tour took us through several tiny former mining towns along the rushing Yuba River until we arrived in Auburn, CA. We had to take one of our rare turns on a major highway which directed us West to Roseville for the night. Day 4 was planned as a “Half Day” so participants could use the remainder of the day to get back home. It was only a 75 mile drive, but at nearly 2 hours, you can imagine the route! We followed the American River Canyon, which is also part of the original Gold Discovery area and just a short distance from the original discovery at Sutter’s Mill. We even drove over and under the Foresthill Bridge–this is California’s highest bridge at 730 feet. Driver Alan Straub (Orange Group 4, Position 14) was Chief Engineer during the construction of the bridge, so it was especially meaningful to all of us. 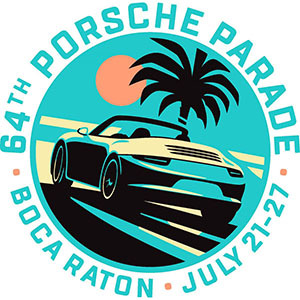 The cars ranged from the oldest being an all-original 1991 Carrera-2, to a 2017 991 Turbo-S Cabriolet, with a sampling of virtually everything in between. As I mentioned, Zone 7 is comprised of 10 Regions. There were representatives from eight of those ten Regions on the Tour. Most of our fellow Tourers had never been on most of the roads we travelled and (except for the Leads, who were required to “dry run” each leg in advance), no one had driven the entire route before. For most, daily life is in the congestion of the Sacramento Valley, the Bay Area and the immediate surrounds. 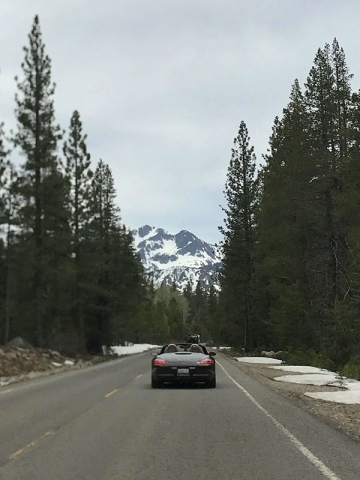 For them, the opportunity to begin riding a rural or mountainous road, especially one worthy of putting their “Porsche to the test”, requires a couple of hours of fighting traffic (each way). Apart from four days of incredible driving experience and fabulous scenery, there was camaraderie built that we had not anticipated. Our Teams were identified by Color and Position Number, and stayed in position nearly the entire time! As a result, each Team/Group “bonded” as a family. Most have kept in touch, even weeks later. Dinner was with all four Teams, so it provided an opportunity to meet the rest of the participants. Dozens of pictures have been traded amongst us, and a Facebook Page was even created. There have been multiple requests to “do it again!” And perhaps we will…….